It’s Gary McCaffrie! 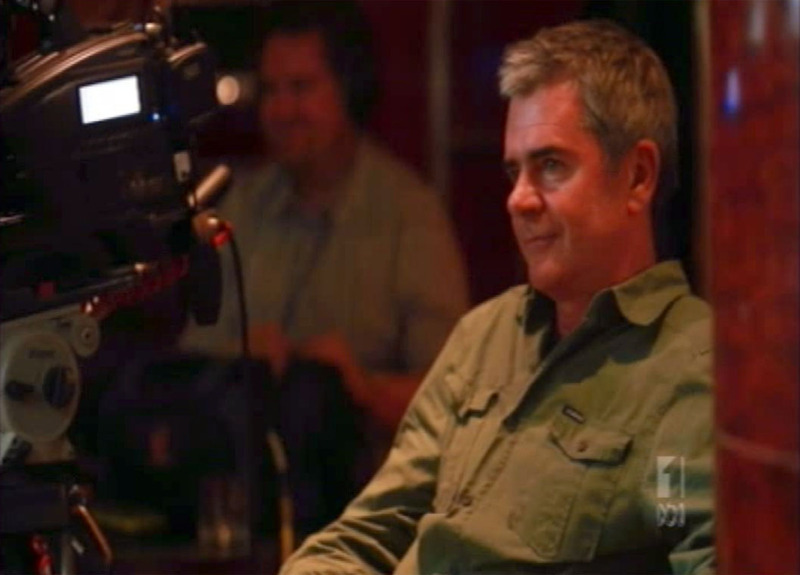 – Shaun Micallef Online! If you don’t know Gary, he’s the yin to Shaun’s writing yang… or something. It was he who got Shaun into the Full Frontal writers room, eventually taking hold of the show before creating The Micallef P(r)ogram(me) together, and the two have been collaborators ever since. Gary’s not a spotlight kind of person, but I was lucky enough to meet him and he agreed to answer some questions. Me: I would describe you and Shaun as a partnership, working together on nearly every one of Shaun’s projects. Gary: Not every one, there’s exceptions. But we’ve worked on a lot of comedy together, because we have a really similar sensibility. In our comedy Venn diagram, the intersecting bits are quite big. The same comedy loves and influences? Some of them, not all. Shaun’s more of student of comedy, and he likes a lot of really old comics and a lot of the physical comics from the silent era and the post-silent era. I’m not much of student of that material, I basically start with The Goon Show. We share similar ones, but he’s got a much broader base of comedy influences. You’ve written for many Australian comedy shows. Is it different writing with Shaun than with others? We don’t really sit together and write. Even on The Micallef P(r)ogram(me), we would only write about a third of that sitting together at the computer. We both tend to like being on our own and writing something from start to finish. On this show [Mad As Hell], we don’t write together at all, and because of the nature, there’s so much material required each week, it’s more efficient to divide your time individually. So is the process writing something and seeing if the other one laughs at it? It is a bit, but our sensibilities are similar. I know how he’s going to deliver the material. Sometimes he’ll tweak it a bit to help his delivery, I just know I’m in safe hands when I write for him. As a writer and not a hands-on producer, that is invaluable. When you’re a writer on Fast Forward or Full Frontal, you have no control, and you just hope that what comes out closely resembles what you originally wrote. With Shaun, he’s got a firm guiding hand over this show, you’re in safe hands. Is there any comedy program you wish you’d written for? Or any you’ve enjoyed the most? The Norman Gunston show was very influential on me. I think I recognised the comedy of failure was especially funny. There’s any number of shows I’d like to have written on, but rather than wish I’d written something, I think if I see something of really high quality, it inspires me to write something new and different myself, and push myself in my writing. I think in sketch terms anything you watch when you’re 15-16, like Not The 9 O’Clock News or The Two Ronnies, are going to have a big influence and certainly did on me. Do you ever hold onto unused sketch ideas? Something that might not work at the time, but maybe want to bring back later? Always. Nothing’s ever wasted, a mantra we both hold dear I think. Something that’s written but doesn’t quite work, there will be something salvageable in it. I think we both have a massive amount of material [in a bottom desk drawer] that will be mined at some stage, maybe for a line or a character. Nothing goes to waste. Famously you didn’t want David McGhan to return to The Micallef P(r)ogram(me) as Dr Miracle. Are there things you still disagree about with Shaun? That got blown a little out [of proportion], as if I hated David McGhan. Were you tired of him maybe? Yes, that’s right. Dr Miracle was presented as a bit of a fait-accompli on that show. Shaun had written these massive pieces and I said “these are a bit long for the show”, and he said “they’ll be alright.” And next thing I knew, they’d built the sets. Absolutely, there are pieces that I say “I’m not so sure about this”, and he takes that into account. He wants my opinion on something, but he has to take a broader view and goes to the edits and sees that we need something different for a change of pace [in the show] – I’m not taking that into account when I’m giving my feedback. I don’t get involved in the editing on this show. But we certainly have areas where we differ in taste, like two people will do. But like the Venn diagram I mentioned earlier, there’s a big area of intersection, and even in the areas where we might not agree, we know why we don’t agree and can almost predict it, and therefore accept it. Thanks Gary, we’re glad that most the time you do!